While thunderstorms put on a good summer show, they can be deadly, as lightning is very hard to predict. 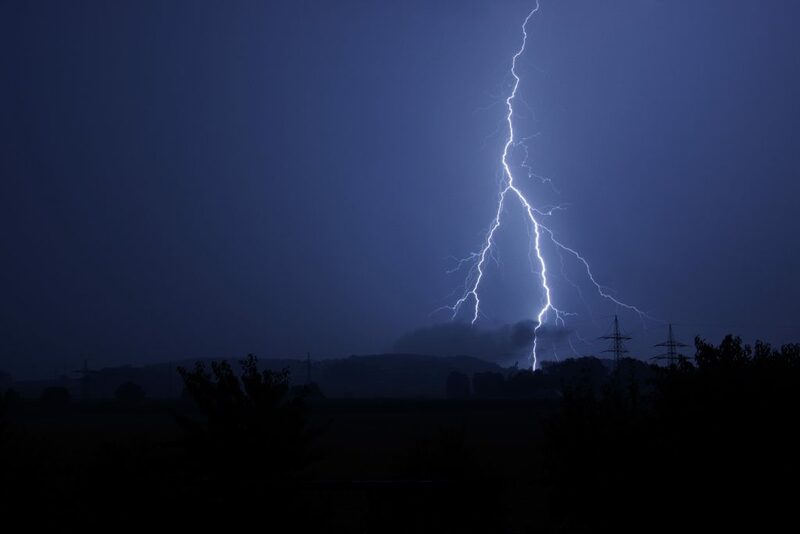 Lightning strikes are one of the leading weather-related causes of death and injury in the country. More than 20 people in the United States have been killed by lightning so far this year. Over the past 30 years, the United States has averaged 47 reported lightning fatalities per year. Make sure you know the facts and educate yourself on how to stay safe during a storm. Lightning is a large discharge of electricity. It can reach more than five miles in length, raise the air temperature by 50,000 degrees Fahrenheit, and contain 100 million electrical volts. Lightning strikes the United States about 25 million times per year, mostly in the summer. It’s estimated that Earth is struck by an average of more than 100 lightning bolts every second. Though it’s best to find shelter inside during a storm, that doesn’t mean you’re still not at risk. Showering, bathing, or using electronics during a storm make you vulnerable even inside your home. Only about 10 percent of people struck by lightning are killed. Most are left with devastating disabilities. Brain injuries, cardiac arrest, nerve damage, and severe burns are likely. Between 2006 and 2014, the majority of lightning strike victims were males between the ages of 10-60. Rubber shoes don’t protect you from lightning strikes. Lightning doesn’t only strike during thunderstorms. It’s present during intense forest fires, heavy snowstorms, and large hurricanes. Golf. It’s a widespread myth that golfers are most likely to be hit by lightning during a storm than anyone else. But this isn’t true. Between 2006 and 2014, 261 people were killed by lightning and fishermen actually accounted for more than three times as many fatalities than golfers. There were also twice as many deaths among campers and boaters than there were golfers. But that’s not to say golfers aren’t at risk and that playing during a thunderstorm is smart, of course. Get low. Some people think that squatting down low or even laying on the ground will keep you safe. Unfortunately, you’re just as likely to be affected by ground lightning as you are by a direct hit. For example, lightning can strike a tree and the current can spread along the surface of the Earth. So if you’re on the ground, you’re likely to get hit. These ground strikes affect a large area and causes the most lightning deaths and injuries every year. Ever seen a whole pack of cows drop dead after a storm? It was most likely a lightning strike that spread along the ground. Assume you’re safe. Each storm varies in intensity and length. People assume if the storm doesn’t seem that bad – sunny skies, no rain, light clouds, quiet thunder – then they’re safe. Some continue their outdoor activities or want to sit on their porch and watch the storm. This isn’t the best idea. Any rumble of thunder poses the threat of being struck by lightning. Stop your outdoor activities and find shelter immediately. Find shelter. Go inside a shelter or hard-topped metal vehicle as soon as you hear thunder. Thunder can be heard up to 10 miles away, and if you can hear it, you’re close enough to be hit by lightning. Be sure to avoid windows while inside and don’t watch from your porch or deck. Experts advise to stay indoors for another 30 minutes after you hear the last rumble, even if the clouds clear up and the sun comes out. Stay away from electronics & plumbing. Avoid corded phones, computers, washers, dryers, and other equipment where you’re in direct contact with electricity. Also avoid sinks, baths, and other plumbing as water conducts electricity. And definitely do not go swimming during a thunderstorm. Avoid concrete. Though you want to find shelter inside, avoid leaning against concrete walls or laying on concrete floors, like in your garage. Most concrete contains wire mesh or metal reinforcing bars that can conduct electricity. If you’re caught outside. If for some reason you can’t find shelter indoors, then get away from high ground, such as hills or mountains. You also don’t want to lie on the ground as you can be struck by a traveling current if lightning strikes nearby. Avoid standing under trees or other tall structures as they are very vulnerable to lightning strikes. And steer clear of bodies of water and other objects that conduct electricity, such as power lines and wire fences. Your best bet is to look for some type of depression or gully to bunker down in. Though the odds of being struck by lightning are about one in a million in a given year and one in 13,500 over a lifetime, it’s better to be safe than sorry.